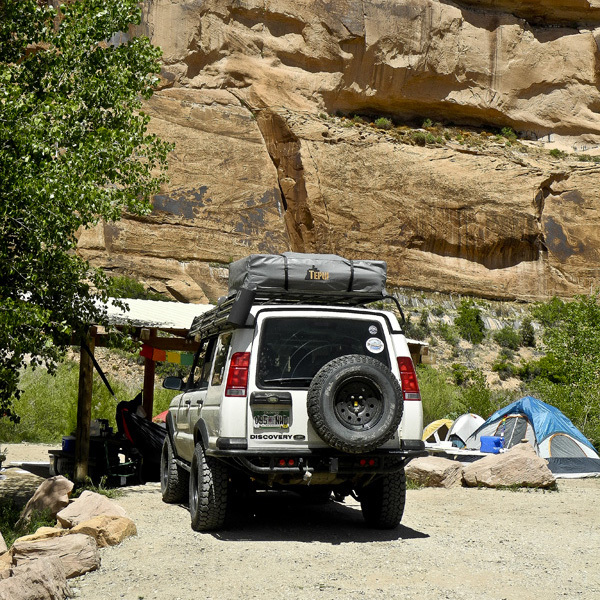 Only 2 miles from the junction of Hwy 191 and UT 128, Goose Island Campground offers proximity to Moab, Utah, without sacrificing natural beauty. The campground sits across the Colorado River from the Wingate cliffs of Arches National Park. Several sites have river access, as well as big cottonwood trees that provide campers with pockets of shade. This campground fills up quickly, especially during the peak season (April, May, and October). Campsites are first come, first served, so plan on arriving early in the day to stake out your spot. In addition to the 17 individual sites, the campground offers two group sites that you can reserve in advance. You can follow a paved path along the Colorado River back to the junction with Hwy 191, with several options extending from there. Heading south for another 2 miles takes you back to town, while continuing north along the Moab Canyon Pathway gives you access to Arches National Park. For longer trips, riders can continue on the road to Dead Horse Point State Park and Canyonlands National Park. Goose Island Campground is an excellent basecamp for bicyclists, climbers, hikers, and trail runners! Note: Goose Island Campground has no water. You can fill your water jugs at Lions Park (intersection of Hwy 191 and UT 128) near the pedestrian bridge dedication plaque, or at Gearheads Outdoor Store in downtown Moab. From the visitor center in Moab, Utah, drive north on Hwy 191/Main Street for about 2.5 miles. Turn right onto UT 128, and continue upcanyon for another 2 miles. Look for the Goose Island BLM sign, and turn left into the campground.